I picked up a QuickPick yesterday for tonight's OzLotto $90 million dollar super draw. A QuickPick lets the newsagent's Whiz-Bang Random Number Auto-Generator Machine takes the hard work out of crossing numbers off a ticket. In our busy modern world, it's the occasional gambler's best friend. But then I decided to open myself up to different possibilities. Surely, I thought to myself, this gigantic jackpot is a good opportunity as any to really tap in to the gestalt mind of my collective friend and acquaintance group. To harness the brain power of reasoned, thinking persons, with the hope of creating a whole greater than the sum of its individual parts. Or, in simpler terms, to get a bunch of people to throw numbers at me. I used Twitter, the oh-so-popular social networking service that both fascinates and frustrates me in turn. Calling my experiment #twotto (a combination of "twitter" and "lotto"), I started soliciting for numbers between 1 and 45. I promised to reward them if I did in fact win. You know, throw 'em a slab of Crown Lager or a Myer gift voucher or something. helping others including charities, homeless spinsters, hairless giraffes and whatever. The seventh game was made up of The Wah's contribution. Genetically incapable of being excited by gambling, he loftily reiterated the fact that the draw is completely random, and all numbers have equal chance of being pulled out of the mechanical tumbola. Ergo, his seven numbers ran 1, 2, 3, 4, 5, 6 and 7. Interestingly, I found the most commonly suggested numbers were, in order, 14, 27 and 7. ALL MULTIPLES OF SEVEN. And yet, what happened this evening, when the draw finally took place? A few of the #twotto games recorded one winning number; one got two - all of which equates to sweet Fanny Adams, as my father would say. However! After checking over the #twotto ticket, I then examined my QuickPick ticket. 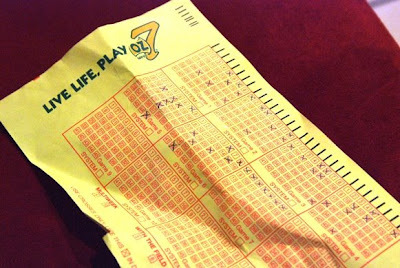 Four winning numbers, which equates to a Division 6 - the second-lowest - prize of $20.45. In this case, THE MACHINES BEAT THE HUMANS. I think there's a lesson in that for all of us. The lesson is don't trust the Internet. Which really you should know by now. So *that* is how Skynet will fund the war against humanity. I would like a lesson in how 27 is divisible by seven. Oooo Scary. That's what happens when you try to do away with the machine, it gives you a love tap so you get back into line.